MELAG provides a range of products for the legally-compliant documentation of the instrument decontamination process. Our products for batch control, log transfer, log archivation, approval and labelling enable you to provide proof of correct reprocessing with ease. Operator-friendly with touchscreen function. MELAtrace is the software of choice for the documentation, approval and traceability of the instrument decontamination process. No further signature or license costs are due after purchase. Benefit from the app-solute best instrument decontamination. The MELAconnect App for smartphone and tablet (iOS and Android) provides even smarter workflows in instrument reprocessing. For reliable instrument traceability: MELAprint 60 prints two-sided adhesive bar code labels and can be connected directly to Premium-Class steam sterilizers or MELAtrace. MELAflash for simple documentation consists of a CF card printer, a CF card and a card reader. An additional practice network for log transmission is not required. MELAnet Box permits the incorporation of the MELAG Class B and Class S steam sterilizers in a network. Automatic log transfer saves time and money in a medical and dental practice context. Legally-compliant documentation and storage in paper form. The MELAprint 44 enables the direct and safe printout of MELAG sterilization logs from an autoclave for secure documentation. The MELAG network adapter permits connection of the MELAprint 44 log printer to the MELAtherm 10 washer-disinfector as well as Premium-Class and Cliniclave series steam sterilizers. Reliable batch inspection for Class B steam sterilizers. Designed in accordance with international hygiene standards, this Helix test is used to inspect compliance with the highest requirements placed on the sterilization of hollow body instruments. Manual batch documentation is made quick and easy by MELAdoc. For complete documentation the double-adhesive labels are transferred from the packaged instrument to the patient record. Traceability has been part of the medical culture of hospitals, outpatient centres, medical practices and eye surgery for a number of years. Although there is currently no legal requirement in many countries for medical and dental practices to trace instruments to each individual patient, owners of medical and dental practices want to feel safe and employ such traceability methods. 1. Issue approval to a batch after instrument decontamination using a documentation sheet or a software solution. 2. Affix the label to the wrapped instruments after sterilization. 3. Transfer the information from the label to the patient records after instrument application. 4. The transferred batch number provides reliable traceability to the instrument decontamination report (log-files). A digital documentation and approval system guarantees the highest levels of reliability and efficiency. The software leads its user step-by-step through the entire instrument decontamination process. After the program end of a washer disinfector or steam sterilizer, you require only a few clicks to perform batch approval and instrument labelling. A software decontamination report contains all the most important approval decisions and is saved as a tamper-proof PDF file. Digital documentation does not require a signature. Each user logs in to the software with their individual user name and password. This restricts access to the documentation and approval procedure to authorized and trained staff. User authentication guarantees the highest levels of security. In comparison with a software solution, manual documentation and approval is performed using a documentation sheet, on which the most important approval decisions are recorded by hand. Approval, e.g. after sterilization, comprises the checking and documentation of the correct process, the checking of the packaging for completeness and dryness and the marking of the sterilization material. Recording further information about the sterilization program and the load configuration achieves complete transparency. The transfer of this information onto the documentation sheet not only takes more time, but involves a greater risk of error. The use of a software also simplifies the log transfer of washer disinfectors, sealing devices and steam sterilizers. The logs are automatically transferred directly to the practice computer or the network. This not only allows a reduced work load, but simple long-term management of the log files, even with retention periods of up to 30 years. In comparison to manual documentation methods, the logs are saved on an output medium or printed after the program end. When using a memory card, we recommend monthly backup to the practice computer. MELAtrace is the ideal software for the documentation and approval of the complete instrument decontamination process. The following section outlines the advantages of our software solution. MELAtrace complies with the requirements for complete documentation and approval in a quick, safe and paper-free fashion. The intuitive operation of MELAtrace combines cleaning and disinfection with sterilization, thereby providing comprehensive documentation of the instrument decontamination process in medical and dental practices. The load management of MELAtrace ensures the highest levels of safety. The software manages the loading pattern of the MELAtherm 10 washer disinfector, the MELAG steam sterilizers and of the DAC Universal quickly and simply. The stored photos of standardized loading patterns help to avoid loading errors. This improves the quality of results in instrument reprocessing. All process steps, program logs and approvals are documented securely and are traceable. Documentation and approval requires only a few clicks; the user has the option of printing bar code labels with the MELAprint 60. The bar code labels mark the wrapped sterilization material. This means that you can scan the instruments after their use with a bar code scanner or fix the label directly to the patient records. MELAtrace is compatible with all standard practice management software designed for this purpose. The transferred batch number means that the decontamination report can be accessed easily in MELAtrace. MELAtrace saves the decontamination report as a tamper-proof PDF file for backup purposes on your practice computer or directly in the network. 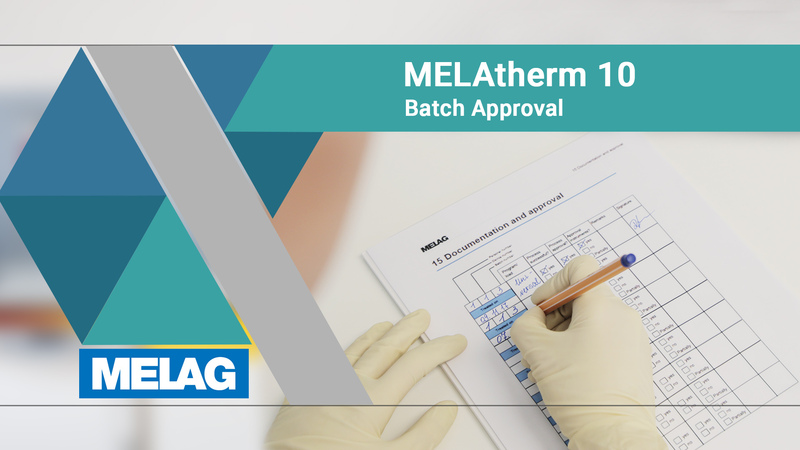 As a system provider, MELAG has specialized in providing products for infection control and the decontamination of instruments. MELAtrace is an important part of the MELAG system solution with which to optimize the workflow of your medical and dental practice. Our price model is especially convincing: MELAtrace guarantees an efficient documentation process without any additional licence fees or costs for the integration of further devices. How does the device licensing work? MELAtrace requires just a single licence for the entire scope of the software. No recurring fees or additional costs for the integration of further devices will incur. The requisite registration form is available from your stockist after purchasing MELAtrace. Please enter the device serial number on the form for the device which you wish to license. Then send the completed form to MELAG. We will provide the license codes for your devices and an individualized license file. To activate MELAtrace, simply upload the file in the corresponding entry field of the software. This integrates your contact data in MELAtrace. Then enter the license codes to activate your devices. This enables you to license new devices in MELAtrace retrospectively and at no extra charge. Which devices can be connected to MELAtrace? All MELAG devices with the appropriate documentation interface can be integrated in MELAtrace in order to represent the complete instrument decontamination process at no extra charge. All modern MELAG steam sterilizers, the MELAtherm 10 washer disinfector and the sealing devices MELAseal 200 as well as MELAseal Pro are fitted with the requisite interfaces for connection to the computer or network. You can also connect the Dac Professional, Dac Premium and Dac Universal from Sirona in our documentation software. MELAtrace does not read out logs from devices from other manufacturers, as we do not receive the required information from the manufacturers. Does MELAtrace provide legal certainty? MELAtrace provides practices and clinics with a legally-compliant documentation and approval procedure for the complete instrument reprocessing. A manipulated decontamination report would not provide legal certainty. International guidelines state that the original contents of a log may not be obscured; nor may changes be made. MELAtrace generates a tamper-proof PDF file containing all the documents and logs required for approval. This PDF file is fitted with an authentication code which protects its data against manipulation. The person responsible is not required to sign the documentation with MELAtrace; the initial user log-in to MELAtrace (user name and password) obviates the need for all signatures. This restricts access to the approval procedure to trained and authorized persons. How is a sealing log assigned in MELAtrace? Having incorporated MELAseal 200 or MELAseal Pro in MELAtrace, you require only a few steps to assign the sealing logs and integrate them in the tamper-proof decontamination report. A precondition is activation of the option for incorporating the sealing log in MELAtrace under “further settings”. After you have determined a load for the steam sterilizer in MELAtrace, click on “Next” to open a window in which you can select the sealing log. A preview field displays the contents of the log. Once you have checked the sealing parameters, click on “Finished” to complete the procedure. The sealing log is stored in the decontamination report, providing even greater transparency in the instrument decontamination process. How long are the retention periods for logs and approval document? The legal retention period for the instrument decontamination proof documentation amounts to 30 years. Complete playback of the logs and approval documents must be guaranteed within this time. MELAtrace complies with the requirements for legally-compliant documentation. The generated PDF file is entirely suited for long-term archivation on your practice computer or in the network. The MELAtrace filter function can be used to locate and access the required decontamination report when required. The decontamination report with ID code and proof of authenticity comprises all the required logs and approval decisions involved in the instrument decontamination process. MELAtrace enables the digitalization of all documentation processes. We are very happy with our MELAG system solution. Now we are able to proceed the instrument reprocessing quickly and efficiently, without any quality suffering.